Glue bails to the backs of fused glass pieces for loop hanging without damaging the glass. Come in to get a pack of 25! Use a small drop of epoxy or other glass adhesive to fix decorative glass to the bail. Bails measure 6 x 15mm (about 1/4" x 5/8"). 25 bails per pack. Use a small drop of epoxy, triolyse or other glass adhesive to fix decorative glass to the bail. After adhesive sets, connect to ear wire or French hook. Measures 1/4" x 3/8". 24 bails (12 pairs) per pack. 18K Gold plated bails are a bright and shiny way to set off your latest creation. Just use a small drop of epoxy or other glass adhesive to fix decorative glass to the bail. 25 bails per pack. 18K Gold plated bails are a bright and shiny way to set off your latest creation. Just use a small drop of epoxy or other glass adhesive to fix decorative glass to the bail. Bails measure 10 x 25mm (about 3/8" x 1"). 25 bails per pack. Package of 25 size small. Silver plated heart shaped jewelry bails. 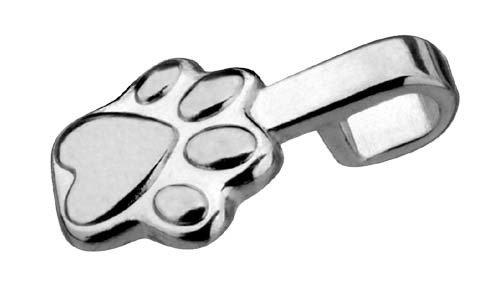 These are adorable paw print jewelery bails!! 25 pcs. per package.